Which guitar pick should use when you’re starting out? 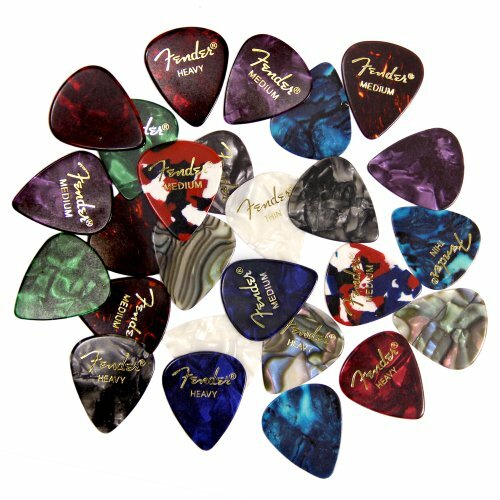 I’m gonna explain some of the differences in guitar picks and show you which ones are best for beginner. There’s four aspects of the guitar pick we’ll be talking about. There’s a shape and size, the thickness of the pick, the actual material it’s made of and then the texture on the pick itself. Let’s start with shape and size. The most standard shape of a guitar pick is this one. Some people call it the fender pick because I think fender is probably the first one to come out with it. It’s a good shape for many people and many styles of playing. Another shape is the larger triangular shape, looks like this a little bit more room to hold on to. And then there’s these a variety of I call teardrop shapes. Small picks like this. This is just one version of a teardrop shape. This is a stiffer pick and often use more for jazz and melody playing. The thickness of a guitar pick can be described as thin, medium and heavy or you can use a series of numbers that are used to be more distinct about exactly how thick it is. A thin pick might be in the area of 046 millimeters A medium pick is in the area of 071 millimeter. And a thick pick might be around point 096 millimeters. A thin pick bends more easily and it’s easier to get a smooth strum when you’re starting out because the pick just bends and glides over the strings. A thick pick is stiffer and it’s a little easier to play melodies or lead guitar. A medium pick is a balance between a thin and a heavy. 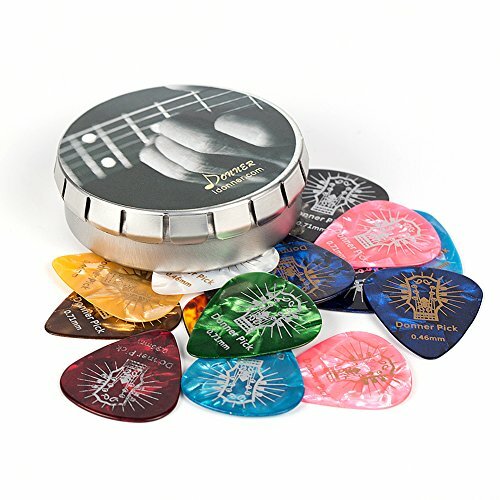 Picks have been with a variety of materials over the years and still are including wood, metal, bone, ivory, tortoise shell and of course a variety of plastics. For practical purposes as beginner, I would stick with the three popular plastic type picks. The first is called celluloid then comes nylon picks and then finally something called Delrin which is often called faux tortoiseshell. It was developed to imitate the feel of tortoise shell Celluloid picks are probably some of the original picks that got popular and also what the fender pick was made out of It’s kind of a springy plastic that has a very snappy bounce back. Then there’s the nylon pick which is a little softer and gives you actually a little softer sound when you use it. It’s probably the least important aspect as long as you’re sticking with one of these three. And finally there’s texture Now the celluloid pick is probably the smoothest of all of them. The nylon pick often have little ridges built into it to make it a little easier to hold on to and the tortoise shell or the faux tortoise shell type picks I’ve seen several. Some have little ridges that are built-in and some don’t but they generally have a softer feel and they’re not quite as slippery as the celluloid picks. And now for my recommendations for you as a beginner. First of all, I would start off with the shape the standard shape that I described. It has enough space to hold on to but it’s not so big that it feels awkward. By the way, I’d stay away from those little teardrop picks when you’re first starting out. For thickness, most beginners are better off starting with a thin pick. It’s easier to get a smooth strum. Now as you gain more experience, you can move up to a thicker pick and you’ll find that when you gain the technique you can have the pick wobble in your hand to get a smooth strum even though it’s thicker but by having a medium or even a heavy pick you can do more things. You can play melodies within your rhythm. You can hit base notes and of course you can go from rhythm guitar to playing some type of lead or melody. Now the different materials do actually create a slightly different sound but because there’s also a variety of sounds you can make with different technique. It’s better to wait a little bit until you have more experience to start worrying about the differences in sound on the pic. I’d still however encourage you to buy maybe one of these little variety of picks and try out the different materials and see if you happen to like one more than the other. 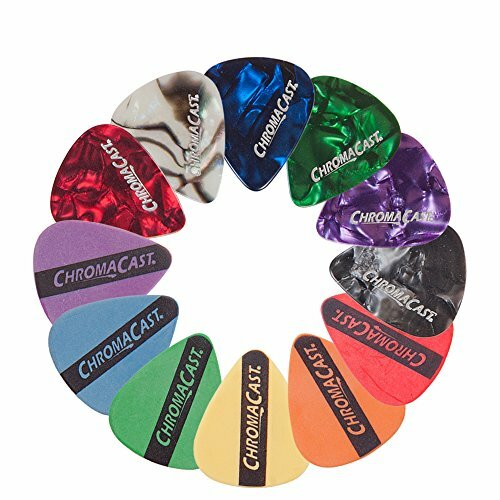 So in summary my recommendation is a standard shaped guitar pick thin for the beginner and as you get more experienced move up to a medium or maybe even heavy and any of the materials will be fine celluloid nylon or that Delrin or faux tortoise shell.